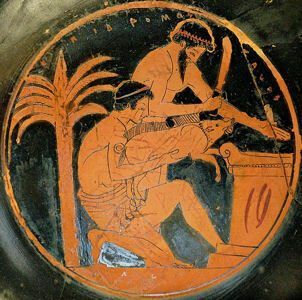 In ancient times (Greece and Egypt come to mind) ritual slaughter and animal sacrifice was one and the same. And while many religions have changed practice and now have different offerings to deity, there still are traditions that perform ritual animal sacrifice. A series of recent news articles about animal sacrifice in the US (about Theodists, Orthodox Jews, Santeria) led me to look into this issue, with some interesting tangents along the way (Tongans in Texas, kashrut and halal dietary laws, and Supreme Court cases). From what I can tell the traditions discussed here place great value on ensuring these animals do not suffer. Opponents (that I presume are mostly from the religious mainstream) cite animal cruelty, public health hazards, and related issues. The GOP in Queens, NY will not replace Pagan high priest Dan Halloran as their candidate for District 19 city council in the November 3 election. 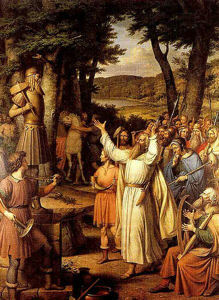 Halloran is First Atheling or king in his faith, Theodism. Though Halloran’s site notes that “Theodism regularly practices blood sacrifice,” he explained that it is similar to the kashrut practices of the Jewish faith. Germanic neopagan Theodist blood sacrifices ((known as a type of Blót for some groups) being compared to kashrut (kosher) dietary laws is an interesting claim. 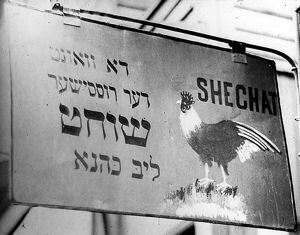 There are many facets to Jewish kashrut ritual slaughter of mammals and birds, known as Shechita or in the related Islamic Halal tradition known as Dhabihah. However, these two systems of ritual sacrifice of certain animals to comply with dietary laws do not appear to be anything like the direct sacrifice of an animal to the gods in a Theodist celebration. The Hialeah Santeria church appealed these ordinances to the US Supreme Court, who in 1993 unanimously decided in their favor charging the city of Hialeah, Florida of illegally enacting ordinances designed to persecute Santeria practitioners. Many thought this would be end of specific challenges in this area. I had no idea they use so many animals to ordain a priest/priestess in Santeria. (40 animals!) This does start to invite claims of this being a public health hazard when done in a city neighborhood (ah- my past as a health inspector returns); but how is this different than the 4,000 chickens sacrificed in Queens, NY for Kapparot? Or how is the slaughtering of animals a public health issue when residents from Tonga also residing in Euless,Texas often buy pigs for festivals, kill them in the back yard, and then roast them? (Or roast 15 pigs at a time at a church in town?) It’s noted as a “cultural” tradition, and not a ‘religious’ one. Euless reportedly has one of the largest Tongan populations outside of Tonga, and a championship high school football team with Tongan players. It seems that the City of Euless doesn’t deprive the Tongans from slaughtering and eating 200-pound pigs in suburban backyards or a church in their city, but yet they have issues with followers of Santeria. And what about the other ethnic groups that instead slaughter domestic animals as part of worship- such as the Hmong? So where does government or a community draw the line on animal slaughter, ritual or otherwise? Obviously, that line is all over the place- confusion abounds. And that confusion not just a recent or US-only situation. Various countries in Europe prohibit Jewish and Islamic food animal slaughtering methods, resulting in charges of this being religious persecution rather than protection of animal welfare. (Nazi Germany infamously prohibited Jewish shechita.) However, recent studies are showing these old slaughtering methods to be humane. 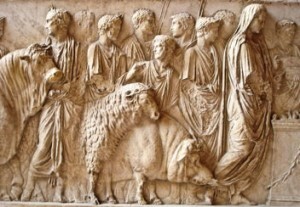 Of the major issues with ritual animal slaughter- including animal cruelty, public health, public safety (as in running a church out of your home)- the most difficult is ‘is it ethical in this age?’ Not ‘is this a religion’ in my/our worldview, but is ritual animal slaughter, or for that matter the use or letting of any blood for religious purposes, ethical? Yes, it’s a whole other issue, but it’s an issue for the religious practitioners themselves. 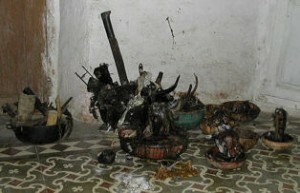 I suspect that the practice of animal sacrifice among Santeria groups varies widely; I would hope that using 40 animals to ordain a priest would have less to do with the number of people to feed at the event and more with proper, frugal, gifts to the Orisha. It seems that these concerns have started some changes; the Ifa Foundation in Florida offers individuals initiation in either the traditional system utilizing animal sacrifice, or through bloodless initiation. I personally know no pagans that use animal sacrifice, and the term ‘reformed’ in some types of druidry is in part acknowledging that they have no desire to continue with the questionable social mores from thousands of years ago (including animal sacrifices). I knew one pagan in Ireland who stumbled across a guardian spirit wanting blood in a chalice, and of course his group wisely turned away. To say that humans have killed off large numbers of animals (including entire species) is an understatement. I can’t believe the gods want even more blood in their rituals. Many of us don’t live off of agriculture, and our wealth is not animal based anymore. These animal sacrificing traditions could find alternatives, such as accepting donations for organizations that preserve animals or habitat instead of buying up animals for ritual sacrifice. They could donate animals to the world’s poor through organizations like Heifer International, World Vision (Christian), or Self Help Africa. (Give 25 pigs to a village in Africa for $3,000.) Lend money to third world working poor entrepreneurs with Kiva. Or put aside money for a fund to obtain property for their congregations. Couldn’t these traditions ask their gods if these new sacrifices would be worthy?